Brands covered: Dr. Group GHC, E3Live. For your convenience, a summary of this guide: supplements for candida protocol. Candida supplements are well known for their importance to the candida and yeast infection treatment, but also for causing many issues. A common misconception about candida supplements is that antifungals are necessary to kill the yeast. This approach usually leads to many issues with very little benefits as it ignores the most important factor in any candida treatment and yeast cleanse – what is preventing your body from naturally balancing the candida overgrowth. Using candida supplements correctly can make a big difference in your candida treatment, and can also minimize many unnecessary discomforts and issues. In this “best candida supplements” experts guide we cover both the candida supplements that you should avoid, as well as the ones than can make a big difference in your candida cleanse. Detoxify and cleanse the colon from waste buildup that can feed candida. Optimize the body’s natural toxins elimination function. Prevent and minimize die off symptoms. Help transition to the candida diet by improving digestion and nutrients absorption of foods. Break down candida’s cell wall. Restore healthy gut flora and normal yeast balance. Probiotic strains that are specifically effective against candida. Balance candida overgrowth and yeast infections in more severe “stubborn” cases of candida. Notice the antifungal supplements are not always needed. Specific key nutrients required by the body to repair the damage caused by the overgrowth. Help to prevent nutritional deficiencies and free radical damage. About half of the questions we get everyday are related to candida supplements. Unfortunately, many people experience issues during their candida cleanse after taking the wrong supplements or because they did not use them correctly. Many anti candida supplements contain harsh and aggressive ingredients that can damage your body and cause serious health complications. Others are not potent enough, use formulas that do not make any sense and are not backed by science. There are many herbal supplements and antifungals that are completely natural; however the fact that a supplement is natural doesn’t mean it is safe. In fact, we see many cases of people that got severely ill after using natural antifungal remedies, anti yeast pills, herbs or supplements as a part of the candida detox. What is Preventing Your Body From Healing Itself? The most important step to do before starting any candida treatment is to optimize your digestive tract and toxins elimination functions; a constipated, congested or irritated colon is a breeding ground for candida and other pathogens. No matter what medication, yeast infection or candida supplements you may take, as long as your colon has waste buildup that can feed candida, candida will continue to grow and release its toxins in your digestive tract. This applies also to foods, even healthy foods that are recommended for the candida diet; the waste buildup makes it difficult for the colon to move the foods you eat in a normal pace. As a result, the foods may stay longer in your digestive tract, get rotten, and become toxic. This critical step is often overlooked, and is the main reason why many people can’t heal from their candida and yeast issues despite following very strict candida diet protocols. It is also the cause behind the healing crises and die off symptoms most people experience during the treatment; it just takes your body too much time to eliminate the dead yeast and its toxins. The longer these released toxins stay in your system, the more negative impact they may have on your body, causing many discomforts and in some cases even damage to vital organs. The fact that you have candida and yeast issues is a strong indication that your elimination function is not effective; otherwise, you won’t have these to begin with. Oxygen colon cleanser (Oxy-Powder ®) as its name suggests, uses oxygen in the colon to detoxify and loosen toxins, undigested food particles and waste buildup so they can be flushed out naturally by the body. It is a very straightforward concept: overtime this waste buildup becomes drier and harder and sticks to the colon wall to a point the body can’t eliminate it through normal bowel movements. The released oxygen loosens this toxic waste, so that the body can easily eliminate it. When your colon is free of all this waste buildup, it can get rid of toxins quicker during your treatment, which can prevent and minimize die-off symptoms or provide relief in case you already experience ones. This is done in a completely natural and gentle way, yet it has shown to be very potent and safe. Doing an oxygen colon cleanse also means that there will be less waste and undigested food particles that can feed candida and other harmful organisms. This creates an ideal environment in your gut and body that can encourage friendly probiotic growth while limiting the growth of candida and other harmful organisms, hence making probiotic supplements much more effective. This is especially beneficial for candida and yeast issues, considering that the majority of the candida overgrowth occurs in the colon. Oxygen colon cleansers work in a completely different way than fiber, herbal and laxatives colon cleansers and are the preferred choice of many health practitioners due to their efficiency, ease of use, and safety profile as well as the many benefits of the released oxygen in the digestive tract; Oxygen is one of nature’s most potent toxins cleansers and plays a key role in neutralizing and removing toxins from the body. This is very beneficial during the candida cleanse where the levels of released toxins are increased. Oxygen colon cleanse (Oxy-Powder ®) has been a part of our candida and yeast protocol for a very long time. We strongly believe it is one of the key factors to our protocol’s high effectiveness and success, and especially to the low occurrences of die off symptoms during the cleanse (see survey details below). The progress many people are able to achieve during the 5-10 days of the oxygen cleanse is so significant, that it makes anti-fungal supplements optional in a lot of these cases. Oxy-Powder formula works by using time released oxygen in the entire digestive tract (25-30 feet) for up to 18 hours, which enables it to detoxify and eliminate large amounts of waste buildup that may have taken many years to accumulate. This effective toxins removal mechanism is also very safe: Oxy powder has been on the market since the late 90’s with millions of people that have already used it. In a survey with 150 systemic candida patients, participants were asked on their die-off symptoms (herxheimer reaction) during the candida treatment and whether or not oxy-powder was used. Oxy-Powder made a huge difference: only 8% of the patients who used oxy-powder experienced die-off symptoms! Most people who use Oxy-Powder report a sense of “great relief” that often comes with increased energy, higher clarity, a clearer complexion, and significantly better bowel movements and digestion, with many digestion issues such as constipation, bloating, body odor and gas greatly improved. These improvements are not surprising considering that this toxic waste weight may be 10-20 pounds and sometimes even more. When the body gets rid of such a burden, it has more energy and resources to perform better and to actually heal other areas which were neglected before. Please note: Many people report seeing the presence of yeast and candida in stool, and in some cases with other parasites. This is normal: the waste buildup usually feed candida and other harmful organisms, so when it is removed from the body during the cleanse, they are flushed out as well. This is usually the point where people start to feel the “great relief” along with other improvements from the cleanse. Another common thing to expect during the oxygen cleanse is temporary watery or gaseous stools with “bubbly” bowel sounds. These are the oxygen bubbles turning the hard waste buildup inside the colon into liquid or gas which enables the body to flush these toxins out more easily. Doing an oxygen colon cleanse before or during your treatment is the most important step when treating candida. It is specifically designed to cleanse your colon from waste buildup that can feed candida and improve your body’s ability to purge the dying candida and its released toxins. This can significantly help to prevent many die-off symptoms and manage the ones you may already have. Keeping die offs under control is one of the keys to a successful treatment, since die-off symptoms make many people go through so much suffering and discomfort, they have to stop the treatment. Poor digestion is very common in cases of candida and yeast issues. What many people don’t realize, is that digestion issues may be the main reason they don’t heal. Furthermore, people with digestion issues such as bloating, gas, constipation or diarrhea tend to suffer more from candida die off symptoms during the treatment. Digestion issues typically lead to fermented and undigested food particles that can feed candida and other harmful organisms. They can even weaken the entire immune system. This can create an environment in the body that makes it very hard for the body to naturally balance the excess yeast overgrowth. In many cases it can even cause the candida overgrowth to become worse. Besides the many discomforts and the ongoing stress on the body, having digestion issues may also mean you are not absorbing all the nutrients from the foods you eat. Overtime this can lead to vitamins and minerals deficiencies which can evolve to more serious, sometimes permanent health complications. This is exactly the reason why many health providers recommend their patients to take enzymes supplements; coupled with proper dietary changes, it is a very effective way that can significantly promote healthy digestion while helping the body to naturally balance the candida overgrowth. Digestive enzymes break down the foods we eat into their smaller building blocks, which enhance their absorption and uptake by the body. You can eat the healthiest foods in the world, but without sufficient digestive enzymes, your body may not absorb all the nutrients from the foods you eat. Systemic enzymes are essential for good overall health; ongoing tasks such as immune system support, tissue repair, organs regeneration, inflammation reduction and others depend on having enough systemic enzymes in your body. This is especially important in cases of candida and yeast issues, since systemic enzymes help the body to manage the excess yeast and candida overgrowth by directly breaking down candida’s cell wall. We recommend taking systemic and digestive enzymes during the early stages of the candida treatment where you are still adjusting to the candida diet and the treatment, as well as in cases of digestion issues. This is the point where enzymes truly shine and provide the most benefits by promoting healthy digestion and optimal nutrients uptake despite the transition to a new diet with foods you may not used to. Having sufficient levels of systemic enzymes at this stage of the treatment is also very beneficial, since it can help the body to better handle the excess yeast and its toxins. The best digestive enzymes for candida are the enzymes that support the digestion of the foods in your own candida diet. Since different enzymes are required to digest different type of foods, you want to make sure the enzymes included in the formula match the foods you eat. The product label should clearly describes which digestive enzymes are included in the formula and which foods they help to digest. VeganZyme ® is our preferred choice for a multi-enzymes supplement during the candida treatment, and it has been a very important part of our protocol, especially for people who have digestion issues or food sensitivities. The biggest advantage we see in VeganZyme has to do with its versatile formula. With a total of 20 digestive and systemic enzymes, it can support the digestion of a wide variety of foods making it ideal for many different diets, cuisines, and health conditions. VegamZyme systemic enzymes profile is highly diverse as well, and can effectively break down excess yeast, candida, mucus, allergens and other toxins. To get these benefits, you usually have to combine multiple enzymes supplements which can make things complicated with more pills to take and more things that can get wrong, such as potential interactions between different formulas we see quite often, or not including all the needed enzymes. In terms of quality and stability, VeganZyme formula uses plant based wide pH range enzymes, that are highly stable in the body, are not destroyed by the stomach acid and can work throughout your entire digestive tract and body. Most people feel the improvements from veganZyme within a matter of days: feeling “light” after meals, having more energy, less digestion issues and better bowel movements. If you currently have digestion issues such as gas, bloating, indigestion, heartburn, acid reflux or food sensitivities, VeganZyme may provide a significant improvement and relief from these discomforts. its formula supports the digestion of a wide variety of foods, including foods that are harder to digest. This means that dining out or eating larger variety of foods that may not always be ideal can still be well managed by taking 1-3 capsules before your meals. This makes the candida diet much more reasonable and easier to follow, and for many people it also means that they can stay on the plan until they are completely healed. systemic & digestive enzymes are recommended during the early stages of the candida treatment where you are still adjusting to the candida diet and the treatment, as well as in cases of digestion issues. This is the point where enzymes truly shine and provide the most benefits by promoting healthy digestion and optimal nutrients uptake despite the transition to a new diet with foods you may not used to.Having sufficient levels of systemic enzymes at this stage of the treatment is also very beneficial, since it can help the body to better handle the excess yeast and its toxins. Systemic candida and yeast issues are usually a result of gut flora imbalances between candida to the friendly organisms that normally control candida from overgrowing. Probiotics supplements work by populating the intestines with beneficial organisms that can help to restore these imbalances. Using probiotics supplements for yeast infections and candida overgrowth is very popular, although most products on the market are not specifically designed to treat candida. These products can still be very good for the overall health and provide many potential health benefits, just not the best type of probiotic for yeast infection and candida issues. What are the best probiotics for candida overgrowth and yeast issues? During the candida treatment, we highly recommend to focus on probiotic strains that their main characteristic is yeast and candida elimination. A probiotic supplement is going to be as good as the probiotic strains used in its formula, so it is important to make sure the probiotic strains used are backed up by science as effective against candida, but on the other hand safe and not too aggressive. Many people are surprised to learn their probiotics supplements caused side effects such as bloating, gas (flatulence), constipation, diarrhea, abdominal pain and even acne. In some cases, the reaction was so severe, that they had to stop the treatment! The fact that a probiotic strain is effective against candida is not enough; it also has to work in a gentle and safe way in order to help the body balance the yeast overgrowth at a rate your body can handle. Another important factor to consider has to do with stability – the probiotic strains need to be stable inside the body so they can survive the stomach acids, as well as stable outside the body with a solid shelf life profile; many probiotic strains must be kept refrigerated and by the time you get them lose their strength significantly; other may be potent at the time of manufacturing, but lose their strength due to low stability or poor manufacturing methods; to avoid these common scenarios, it is essential to choose probiotic strains known to be stable from a trusted source. 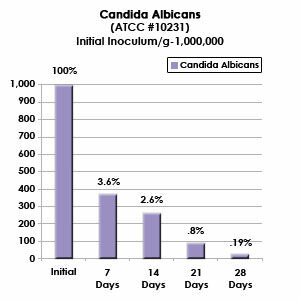 Laboratory test results of Bacillus Laterosporus BOD (Latero-Flora) challenge test with candida. Latero-Flora has demonstrated a strong inhibitory effect on candida. The Bacillus laterosporus BOD strain is a good example of a probiotic strain that was shown in research to be very effective in eliminating candida as well as other pathogens such as Salmonella, E-Coli, and Streptococcus Faecalis. Other testings have shown it is completely safe with no indications of toxicity, even at extremely high dosage. This strain has a natural ability to encapsulate itself when exposed to different environment changes (spore-bearing), and as such it is highly stable, resilient, can easily pass the stomach acids and become very active in the body. The fact that it is stable in room temperature and doesn’t need to be refrigerated means you can take it with you wherever you go. It also promotes healthy digestion: in one study, participants who took Bacillus laterosporus BOD, felt significant relief to many digestion issues discomforts they previously had. This is an important benefit during the candida treatment, as digestion issues are very common in cases of candida overgrowth. Since systemic candida issues are usually caused by gut flora imbalances, probiotics are a very important part of the treatment. Over the years, we researched and tested many probotic strains; Bacillus Laterosporus BOD strain is one of the best probiotic for candida overgrowth we tested and it has been a part of our candida protocol for a long time. The Bacillus Laterosporus BOD product we have been testing and using as a part of our candida protocol is Latero-Flora and it is our preferred choice of probiotics during the candida treatment. Latero-Flora potency and effectiveness are specifically guaranteed by the manufacturer, and it comes with a complete 180-day money back guarantee. Since systemic candida issues are a result of gut flora imbalances, probiotics for yeast overgrowth are a very important part of the treatment. During the candida treatment, we highly recommend to focus on probiotic strains that their main characteristic is yeast & candida elimination. Other important factors are the strains safety and stability. Are Antifungal Supplements Really Needed? Many people use anti fungal supplements in order to artificially “kill the yeast” where what you really want to do is to restore the natural balance in your body, so your body can safely eliminate the excess yeast naturally – two completely different things. Antifungals usually bring the most benefits in cases of “stubborn” candida and yeast issues that are still not fully resolved despite following a clean candida diet, oxygen colon cleansing, and consistent use of systemic & digestive enzymes with “Candida Targeted” probiotics for at least 4 weeks. When using anti fungal supplements, following principles should be followed for the best candida cleanse results. Dosage: Always start with the lowest possible dosage of the antifungals and test your body’s response. Gradually increase the dosage if needed. Some people are more sensitive than others and may get great results using very low dosage. This is also a good way to minimize side effects. More is definitely not better in this case. Antifungals Rotation: It is common for candida to develop resistance when the same ingredients are used overtime. Take breaks or alternate between different types of anti fungal and candida supplements if needed. Natural vs. Synthetic: Synthetic antifungals that aggressively attack candida may create additional imbalances that can damage other parts of your body and won’t help you heal. For this reason, natural ingredients that work with your own body’s natural elimination functions are usually preferred. When choosing natural antifungal supplements, it is important to make sure they focus on organic or wildcrafted ingredients from a trusted source, as these are usually more potent and safe compared to conventional non-organic ones. One of the biggest concerns with conventional extracts, is that many of them contain high levels of toxins, pesticides, preservatives and allergens that can cause a strong reaction and side effects that not only can make you feel bad, but can also lead to further health complications. Natural Doesn’t Always Mean Safe: The fact that a supplement is natural doesn’t mean it is safe. We see many cases of people that got severely ill after using formulas that were 100% natural. This includes natural antifungal remedies, pills, candida herbs, yeast cleanse pills, anti yeast supplement based products and many other candida supplements. It is critical to only use formulas that are specifically designed for candida and yeast infections that come from a trusted source that guarantees both their safety and effectiveness. Mixing antifungals: Playing mad scientist on your own body mixing various antifungals for candida together, even natural ones, can cause severe health issues. We see these cases every single day. So unless you know what you are doing and have prior experience and knowledge you can depend on, we strongly advise you to pay extra attention when taking different antifungals together. Antifungal supplements can be very beneficial and in some cases necessary, so If you decide to use antifungals, choosing formulas that were extensively tested and are backed up by science may be a more effective and safe approach. “Hidden” Antifungals: The reason this is so important is that natural antifungals are widely available, sometimes as a part of general health herbal remedies, multivitamins and other non candida supplements, so you may want to look at the label checking for anti-fungal ingredients. This can help to avoid unnecessary discomforts many people experience. Pay special attention to antifungal herbs, candida herbs, antifungal tea, candida tea, antifungal foods or extracts derived from foods and herbs. This list of antifungals and herbs for candida and yeast infection is found in many supplements and include tea tree oil, oregano oil, goldenseal, garlic (allicin, aqueous garlic extract, garlic oil), grapefruit seed extract, olive leaf, berberine, pau d’arco and caprylic acid (from coconut oil). Same applies also to natural extracts such as echinacea and astragalus that are widely known for their immune boosting abilities, but also have anti-fungal properties. Remember – candida is a natural part of your body’s ecosystem; helping your body balancing the overgrowth in a gentle and safe way should be the goal rather than artificially “kill the yeast” by using supplements to kill candida. There are many natural antifungal supplements that are quite effective for candida issues. We have seen it in our testing. The main concern is usually regarding their safety. Mycozil ® is our preferred choice for this exact reason. It is one of the most potent natural antifungal supplements we tested, yet it is also very gentle and safe. Mycozil’s formula contains selected organic and wild crafted ingredients with a long history of traditional use for candida, yeast and fungus issues all around the world for many centuries. These natural ingredients are also backed up by science, demonstrating strong anti-fungal activity in a large number of studies. Mycozil works by enhancing your body’s ability to balance the candida overgrowth and excess yeast. This creates an environment in your body that naturally reduces the levels of yeast and candida. You should take Mycozil for 6 weeks followed by 6 weeks break. During the 6 weeks break, evaluate the improvements made and issues that may still present. If you still have health concerns after the 6 weeks break, you can continue with the 6 weeks on – 6 weeks off protocol as long as you see consistent improvements. Many people that use Mycozil report improvements in “stubborn” yeast infections symptoms they have had for many years such as chronic dry skin, candida rash, athlete’s foot, toenail fungus and other skin and nail fungal infections. Please Note: Mycozil formula is very potent, and some people may get the benefits using a smaller serving size. Therefore, start with 1 capsule a day and test your body’s response. Gradually increase the dosage up to 6 capsules a day if needed. Antifungals usually bring the most benefits in cases of “stubborn” candida and yeast issues that are still not fully resolved despite following a clean candida diet, oxygen colon cleanse, and consistent use of systemic & digestive enzymes with “Candida Targeted” probiotics for at least 4 weeks. Taking Mycozil after the initial 4 weeks has shown to be a very effective and safe way to help with these chronic “stubborn” candida overgrowth issues. When most people think about candida supplements, they usually think about supplements that helps to kill candida or cleanse their body. One of the biggest concerns with candida overgrowth however, is nutrients absorption. More specifically, nutritional deficiencies and various health issues. Add to that the modern diet that is typically low in high quality nutrients, and it should be no surprise why many people with candida and yeast issues also suffer from nutritional deficiencies. Without these vital nutrients your body may not be able to effectively overcome the candida overgrowth and repair the damage caused by the overgrowth. This is also important in order to prevent further health complications due to chronic nutritional deficiencies over a long period of time. In fact, many people that have experienced major difficulties in healing from candida overgrowth, finally see a significant progress once they become aware and make sure to consume all the needed nutrients. Vitamin B12 and the rest of the B vitamins. This is a very important step that goes above and beyond candida overgrowth issues. Overtime, certain deficiencies (such as vitamin B12, Vitamin D and others) can cause serious health complications that can’t be reversed and may even become permanent. Taking vitamins and minerals together with the inner leaf of aloe vera was suggested by research to significantly enhance their absorption. Consuming aloe vera daily is also known to promote a healthy digestive tract. These make aloe vera especially beneficial for cases of candida overgrowth where there is a known issue of nutrients absorption in the digestive tract. If you consider taking aloe vera supplements, we recommend to only use the inner leaf from organic aloe vera, in order to enjoy the benefits while avoiding a potential reaction to the latex material (aloin) in aloe vera’s other parts of the leaf. A good example can be found here. Natural antioxidants extracts such as CoQ10, PQQ, resveratrol, and astragalus are commonly used in order to protect the internal organs and cells from the damage caused by the candida toxins (up to 80 different toxins). It is much easier to prevent the damage, than treating internal organ dysfunction once developed. According to the medical literature, chronic stress and reduced antioxidant capacity are considered as risk factors for candida and recurrent vaginal yeast infections. The research data suggests dietary antioxidants as a way of defense that may also prevent recurrent vaginal yeast infections (source). When taking antioxidants, the recommendation is to only use natural antioxidants extracts that are backed by science; a good example can be found here. The science about antioxidants is quite fascinating; antioxidants have been shown in thousands of studies to benefit the health of our DNA, brain, memory, heart and many internal organs functions; as research suggests, antioxidants can promote the health and longevity of every cell in the human body. We should note that many medical professionals take antioxidants themselves every day due to the strong science on their health, anti-aging and disease prevention benefits. Providing these key nutrients so the body has all the needed tools to effectively repair the damage caused by the overgrowth is very important, especially in cases of severe/long history of candida overgrowth and yeast infections. The antioxidant supplement we use in our candida protocol to support cases of high toxicity and oxidative stress is Cell Fuzion. Most people who use Cell fuzion report noticeable improvements with their energy levels, mood and cognitive function. This is very common and can make a big difference in the success of the treatment. You feel better quicker which makes it easier to follow the program. As we all know, vitamins and mineral supplements are very popular and are a normal part of our daily life. Most people take some sort of vitamins – minerals formulas every day. But do these formulas actually work? Can they really improve our health and help preventing nutritional deficiencies? This is especially important for people who do not eat a well balanced diet consistently (which can quite challenging)…Furthermore, there are many factors that may cause issues with food absorption and nutrients utilization from the foods we eat. Such factors may include low absorption in the gut as a result of candida overgrowth, digestion issues, chronic constipation and more.Scientists are still debating about the efficiency of vitamins and minerals supplements. According to research, some minerals and vitamins supplements do absorb in the body, while some are not. Many health experts believe that the reason for that is the way these supplements are made; many of the vitamins and minerals supplements are created artificially in a lab and are not natural. The body doesn’t always recognize the form of these synthetic ingredients which leads to poor or no utilization at all. (Not to mention the potential issues that may occur as the body tries to get rid of these unnatural chemicals). This can be one of the reasons why people don’t feel anything or notice any positive results from taking these supplements.Whole food supplements on the other hand, are a totally different story. They are naturally concentrated in vitamins and minerals, usually in a form that can be easily assimilated by the body. The body can recognize these forms, and is designed to utilize the nutrients from them. Just as nature intended! Whole-food based supplements are very popular with a large variety to choose from. While there are many high quality products available, there are also ones that you shouldn’t get. Watch for High Number of Ingredients – This is so important, it is actually relevant to any supplement you may take. Many whole-food based products contain a lot of ingredients. Consuming many ingredients can cause serious potential issues, such as undesired interactions between the different ingredients, sensitivities and even a strong reaction to one or more of the ingredients. Many people experience stomach pain and digestion issues due to wrong combination of ingredients used. Many of these supplements are not designed to provide nutrients support for candida overgrowth where food sensitivities and digestion issues are very common! With so many ingredients in one formula it is impossible to properly test how they would interact together in your body once consumed. The Source of the Ingredients Matters – The second factor to consider is the source and purity of the ingredients used. Ideally, the ingredients should be fresh, potent and safe. Always select a product from a trusted source that is committed to high quality ingredients. Product should include specific details about each of the ingredients used, their source and potency. Look for ingredients that are 100% organic or wild grown, as they are usually more potent and pure. Watch for Added Ingredients – Pay close attention to the added ingredients; there should be none! many products contain additional chemicals, artificial sweeteners, food coloring and processed sugars to improve the taste of the formula which may harm your health or even cause the overgrowth to get worse. These should be avoided. Finding natural whole-food supplements that are beneficial for candida and yeast issues isn’t a simple task. In fact, many whole-food supplements that are considered very healthy and may be a perfect fit for healthy people, are not recommended for people who suffer from candida and yeast issues; in our research we saw many products with ingredients that can feed the yeast in the body and make the candida overgrowth become worse; many other formulas had ingredients that can trigger allergic reactions or cause strong die off symptoms. A lot of these products are truly great products with many health promoting benefits, just not a good fit for people with candida and yeast issues. E3Live Blue-Green Algae is our favorite choice for nutrients support during the candida program, due to its unique nutritional profile, high nutrients absorption, candida detoxification abilities and a solid safety profile. Specific Nutrients Support for Candida & Detoxification – E3Live blue-green algae contains only one ingredient: a wild-grown organic edible algae called Aphanizomenon flos-aquae (AFA). It is considered by many health authorities as one of nature’s most concentrated whole-foods making it one of the top superfoods in the world. The nutritional profile of the E3Live Blue-Green Algae truly stands out; it is extremely rich in naturally occurring vitamins, minerals, amino acids, chlorophyll, live enzymes, antioxidants and essential fatty acids, all in a form that can be easily utilized by the body (97%). Many of these nutrients are very hard to find in the average western diet and the fact that they can be easily absorbed by the body is especially important in cases of candida overgrowth where nutrients absorption issues are very common. This means that the body can utilize many of these nutrients in order to “fill in the cracks” of missing or needed nutrients required to repair the damage caused by the candida overgrowth. This may explain why many people feel a big difference shortly after adding the E3Live blue-green algae to their diets (see reviews); common reported benefits include increased vitality and energy, better mood, improved focus and concentration as well as reduced inflammation related pain. Balance Candida Overgrowth – Another important benefit of the E3Live blue-green algae has to do with its high chlorophyll content. In fact, it may be the highest known source of chlorophyll in nature, with over 10 times the amount of chlorophyll found in 1 cup of raw spinach and 5 times the amount found in wheatgrass. Chlorophyll can be very beneficial for candida and yeast overgrowth; according to research, chlorophyll may stop candida growth and can also neutralize the toxins released by it. E3Live Blue-Green Algae is available in 2 forms: fresh-frozen which is the closest to its natural state in nature and a powdered form. Both forms are very potent and effective, with the fresh form considered better with more nutrients preserved; just like any natural food – fresh is usually better. For this reason, most people consume the fresh form on a daily basis and use the powder form when they are away from home or travel. Die-Off Symptoms – If you experience mind-balance related die-off symptoms such as brain fog, difficulties to concentrate, mood swings, depression, stress, high levels of inflammation or pain, you may want to consider the more concentrated version of the E3Live blue-green algae called BrainON. This is our recommendation in these cases as well, since BrainON can provide both the natural relief to many of the mind-body die off discomforts, along with the impressive nutrients support benefits of the E3Live blue-green algae. Both BrainON and the E3Live Blue-Green Algae come with 1 year money back guarantee. (1) – Anatomical study of the length of the human intestine, Hounnou G, Destrieux C, Desmé J, Bertrand P, Velut S.